Collaboration and Team Work. Comprised of subject matter experts in finance, information technology, health insurance and health care, the Internal Audit Department’s diverse structure encourages everyone to leverage each other’s skills and expertise for maximum impact. Trust and Reputation with Leadership. We serve as trusted and respected advisors across the organization. Throughout the year, management requests that we perform consultative risk and control assessments. These open relationships provide process improvement opportunities and add value to the organization. Local Impact. Working for UPMC allows you to gain hands on experiences with clients, right here in the Pittsburgh region. We make a difference in our own community through our audit recommendations and inspiring community service projects. Work/Life Balance. I believe in the motto, “Work hard, play hard.” UPMC allows me to do just that. I am encouraged to develop my professional skills through training opportunities and networking events. A flexible work environment and a generous benefit package with PTO allow me to have the right level of work/life balance so I can travel, spend time with my family and enjoy my favorite hobbies. 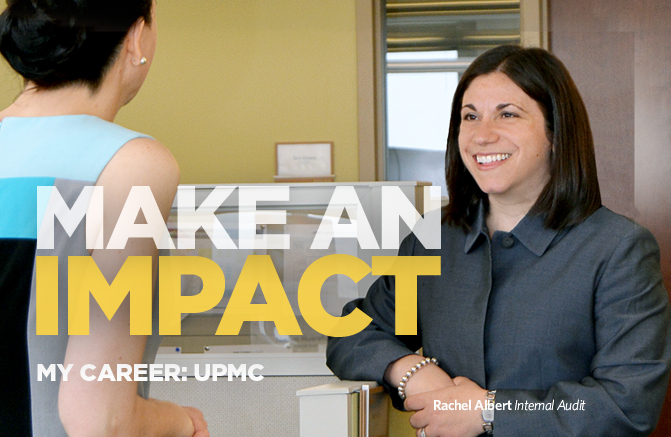 Working in the Internal Audit Department at UPMC has given me the opportunity and power to initiate positive change within the organization. Interested? We invite you to explore opportunities with Internal Audit. Contact your recruiter to get started!